UEFA and Pepsi are excited to announce that for the first time ever, the UEFA Champions League Final will feature a global live music headline performance as part of the opening ceremony pageantry. 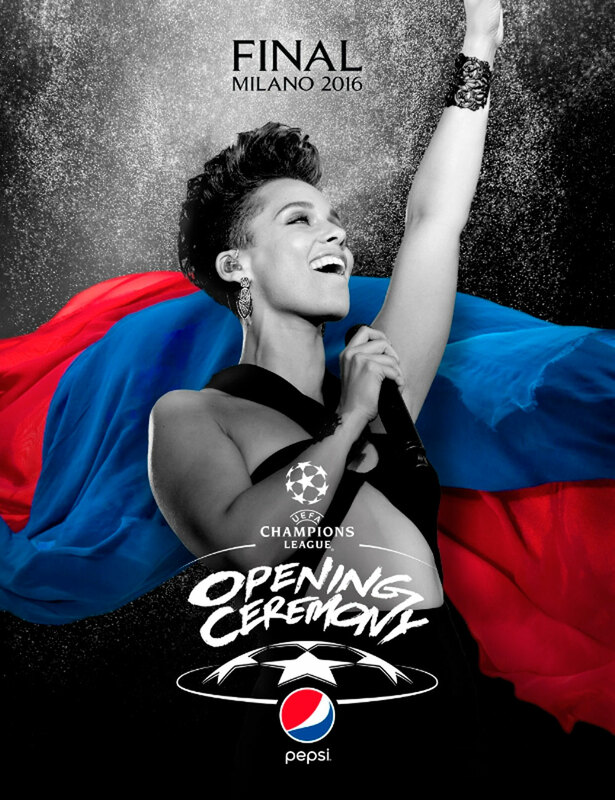 Taking place on May 28th at Stadio Giuseppe Meazza in Milan, Italy, the “UEFA Champions League Final Opening Ceremony presented by Pepsi” will feature Alicia Keys as the inaugural artist to usher in a new live entertainment era for the UEFA Champions League Final. Airing in more than 220 countries, the UEFA Champions League Final is the most watched annual sporting event in the world. This year’s “UEFA Champions League Final Opening Ceremony presented by Pepsi” will merge the worlds of world-class music, entertainment and sports, as well as celebrate design and fashion as a nod to the host city, Milan. The revived opening ceremony marks an expansion of PepsiCo’s existing partnership with the UEFA Champions League, bringing one of the world’s most passionate musicians to a massive global audience and further heightens the excitement and grandeur of the world’s most watched annual sporting event. PepsiCo initially joined forces with the UEFA Champions League in 2015, announcing a partnership with the prestigious European club football tournament where Lay’s, Gatorade and Pepsi MAX / Pepsi serve as lead brands for the competition. In addition to the “UEFA Champions League Final Opening Ceremony presented by Pepsi” performance, Keys – who recently joined Season 11 of NBC’s hit show The Voice in the United States and will release her 8th album this year – will be featured in a variety of integrated campaign elements leading up to the performance.